If there was ever a response to Mitt Romney’s smug RNC laugh line about climate change—or to Obama’s failure to address it—Hurricane Sandy delivered. In truth, Obama’s track record of planetary healing hasn’t been all that great. But it was Romney’s sneering dismissiveness of the very thought that revisited me as Hurricane Sandy howled into New York City. I’ve had the same shudder of alarm during every hurricane over the last decade, regardless of who’s in charge, for the political absurdity feels as huge as the tragedies themselves: George W. Bush’s consulting with oil executives to develop climate change policy. Enduring indifference to American infrastructure. Sarah Palin’s anthem of “Drill, baby, drill!” The United States’ failure to sign on to even the weakest of climate change conventions, like the Kyoto Protocol. Meanwhile, the last two decades have seen a pattern of planetary fever and chills. Studies establish that human activity is causally related to the melting of the Arctic ice, the collapse of fish stocks and the rapid rates of extinction within all classes of life forms. It’s not a question; it is fact. After 9/11, planes were grounded for three days; since then, climatologists have wondered if a rare spike in the range of daytime and nighttime temperatures in the same period was due to the lack of jet engine “contrails” in the sky. Imagine if we had the political will to ground planes again to further test this phenomenon. Imagine if we had the will to ban driving one day a week. But peacefully bringing the engines of industry to a halt is not going to happen, neither for experimentation nor for putative healing. In the meantime, we can fight over whether a state should be able to defy federal guidelines and dictate who can build more houses on their shores; whether earthquake disaster relief can be used for hurricane victims; whether one nation should rein in its pollution problem if another won’t do it first. Or we could see this as a matter of the looming extinction of much of what sustains life forms such as ourselves. There’s much to suggest that unless we do something fast, air quality will continue to deteriorate, temperatures to rise, and oceans to become too acidic to support their present vibrant diversity. Some argue that individual states and municipalities are better able to decide how to handle disasters, that more jobs will be created that way, serving more local businesses. But making states compete for resources in the face of environmental disasters that do not respect political or geographic boundaries is like having daylight savings time on Fifth Avenue but not on Sixth: it’s inefficient, confusing and costly. And it’s unfair. Most insurance policies don’t cover flood damage anymore, for example; if it’s economically rational for companies not to take that kind of risk, what kind of moral sense does it make for governments—charged with the public interest—not to fill that gap with some kind of safety net? Few will forget that, during Hurricane Katrina, some residents of the Ninth Ward died not from drowning, but because authorities were apparently given a greater charge to protect property than to save lives. On Danziger Bridge, police shot at an unarmed black family who appeared to be heading toward the higher ground of a white neighborhood. The bridge is a good metaphor for how we might approach a future of droughts, fires and storms. We can sustain our bridges as pathways that link us, or we can burn them and dig deeper moats. We can address climate stress as collective catastrophe, or we can draw a thousand thin blue lines to mark a multiplicity of war zones. In New York City, 50,000 homeless people need shelter every night. 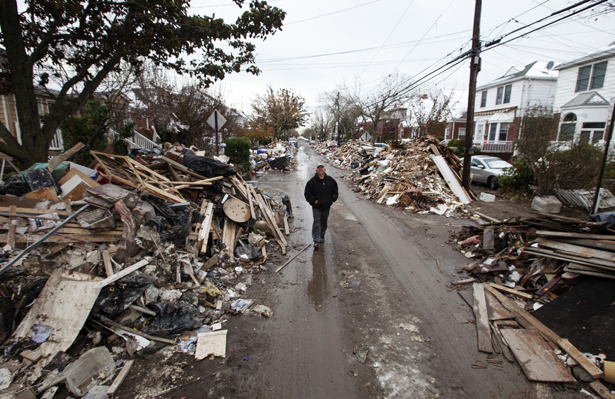 Hurricane Sandy displaced tens of thousands more. Despite exhortations from the mayor, many homeless people resisted going to the shelters—underfunded facilities that deserve their reputation as being madhouses of chaos and assault. Regardless of the forecast, many instead seek refuge deep inside subway tunnels. I wondered about them as those tunnels flooded. Did a welfare system that makes living in a subterranean cave seem like a life-sustaining option send evacuation notices to those hidden colonies in time? I also thought of the wealthier denizens in the sleek high-rises, whose storm prep meant clearing the shelves at Gourmet Garage. Many of them stayed too, preferring to brave the lack of lights, elevators, heat and water in deference to their fear of public spaces. I confess I was among this latter group, snuggled under the covers in cashmere socks, bobbling upon the fantasy that my end of the Titanic really was “Nearer My God to Thee,” and that there would be lifeboats for my kind. In the longer term, however, the risk to planetary life places us all onboard a sinking ship. All hands are desperately needed to widen our sense of what’s at stake: Will a tree dying in the forest be heard? Will a bee dying of insecticide be felt as a loss in the human hive? Will humanity see itself—in all its variety—as one species, to say nothing of one species interdependent with many? There’s nothing wrong with the babble of prayer politicians proffer in the face of disaster, but faith and miracles do not a system of earthly governance make. The very etymology of the word ”republic” is a condensation of res publicae: Latin for the law governing public property, or shared roads, bridges and waterways. After all, even Noah finally got down to the business of building an ark. To help the hurricane victims, please consider donating to the Coalition for the Homeless or Housing Works. Also in this week’s issue, read Naomi Klein on how the recovery from Sandy could be an opportunity to realign our relationship with the natural world.